This easy hike through the Protected Marine Area on the spectacular Jeranto bay overlooking the Faraglioni sea stacks off Capri. This pristine stretch of coast has crystalline water, ideal for snorkelling, and beautiful protected landscapes. 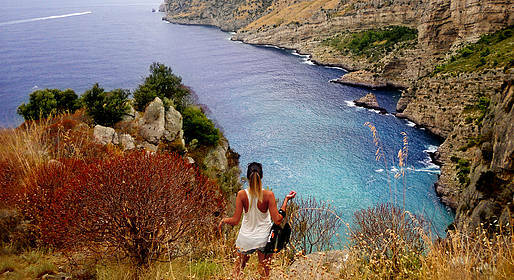 Hike through the Protected Marine Area on the spectacular Jeranto bay overlooking the Faraglioni sea stacks off Capri. The bay was used from the end of the 19th century until 1952 as a limestone quarry for stone used by for the steelworks in Naples. Today the area is a protected reserve where you can visit the historic factory, hike through the beautiful countryside, pass through quiet olive groves, and see the traditional layout of the area's lemon groves. This tour is perfect for singles, couples, families, or small groups of up to 20 people.